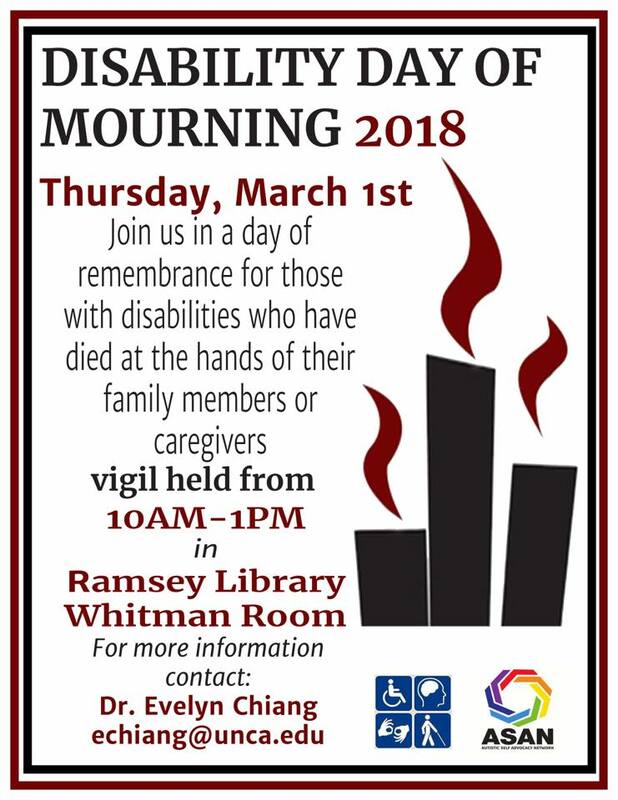 The Day of Mourning, an event remembering and honoring disabled people murdered by family members or caregivers, is held on March 1. Local vigils take place across the United States, as well as in Australia and Canada. In Asheville, North Carolina, vigils have been held at the University of North Carolina Asheville (UNCA) for the past two years. 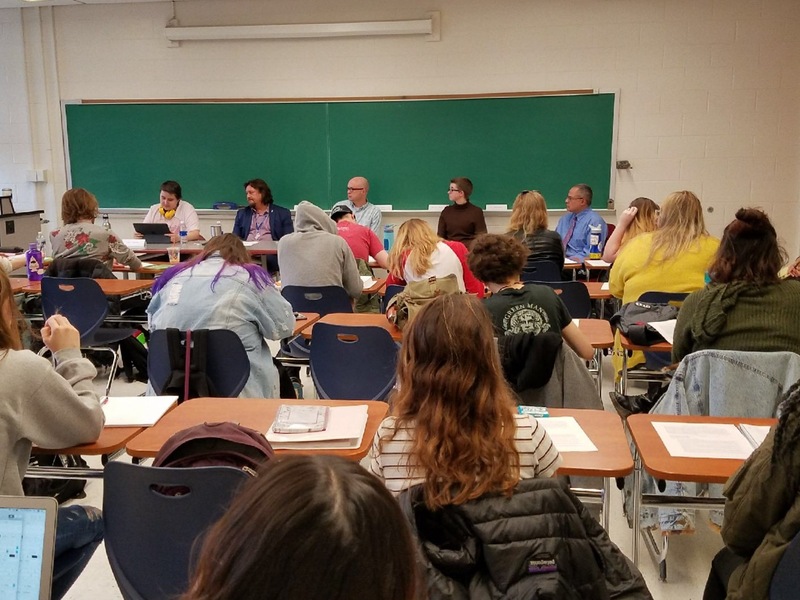 In anticipation and preparation for the event this year, I moderated a dynamic panel discussion in Professor Evelyn Chiang, Ph.D.’s Psychology of Exceptional Children class at UNCA, with some other university and community members joining the class in attendance. The panel included Michael LePage, Western Regional Director for the Autism Society of North Carolina; Jade McWilliams, a neurodiversity advocate and speaker and an adult autistic; Jesse Smathers, Specialty Populations Clinical Director for Vaya Health, the local management entity-managed care organization for mental health, substance abuse, and intellectual developmental disabilities for 23 counties in Western North Carolina; and Becca Wilson, a UNCA graduate and adult autistic who has done research on the Day of Mourning. The panel was powerful—thought-provoking and entirely moving. I am grateful to each panelist for participating. I can’t fully capture the substance of what they had to say, and it’s not mine to: my words would be inadequate representatives of their perspectives and stories. But I can share the questions I asked, a structure we largely adhered to in guiding our conversation. I invite you to consider these questions, which are slightly modified here, and how you might answer them yourself. You are welcome to write a comment below addressing a question or a related issue or simply offering an idea. I don’t often actually expect many comments—other than the Autism 101 post most of my pieces typically only receive a comment or two even when they are well read, although another exception would be entirely lovely. Instead, though, what I most hope for and ask for is thought, reflection, and, goodness knows, from all of us, action and change. Here’s a hypothesis: Our society largely devalues the lives of disabled people. Do you agree with this hypothesis, and if you do, what do you think causes that devaluation—and why does it persist? Do parents, families, and caregivers of disabled children and adults deserve sympathy or support—or both? If the answer is yes to both, or just to sympathy, what does that mean when caregivers cause harm, through actions or disregard, both up to and including murder, to disabled people—is their culpability mitigated by the disability? If it’s not, what does that mean for a perspective of sympathy toward the circumstance of family and caregivers? Parents and families; doctors, the medical community, and therapists; news media, entertainment media, and social media; care and support organizations; schools—biases about the worth of disabled lives permeate all of society in ways that are both overt and subtle. Meanwhile, as the Day of Mourning brings attention to, lives continue to be lost because of our biases about disability and what constitutes worthwhile life. What are necessary steps for broad, effective change? How can progress be made quickly? What is the role of the disability community itself? Is the “disabled community” and the idea of “disabled people” too amorphous and varied as an identity for disabled people to come together effectively as a community to advocate? Is that even their responsibility? Are the existing organizations effective in their work and advocacy here? For the upcoming event, the Day of Mourning on March 1, what would you suggest we include in the event to make it more effective and successful? What tangible actions can we take to fight against and help reduce disability-related filicide? 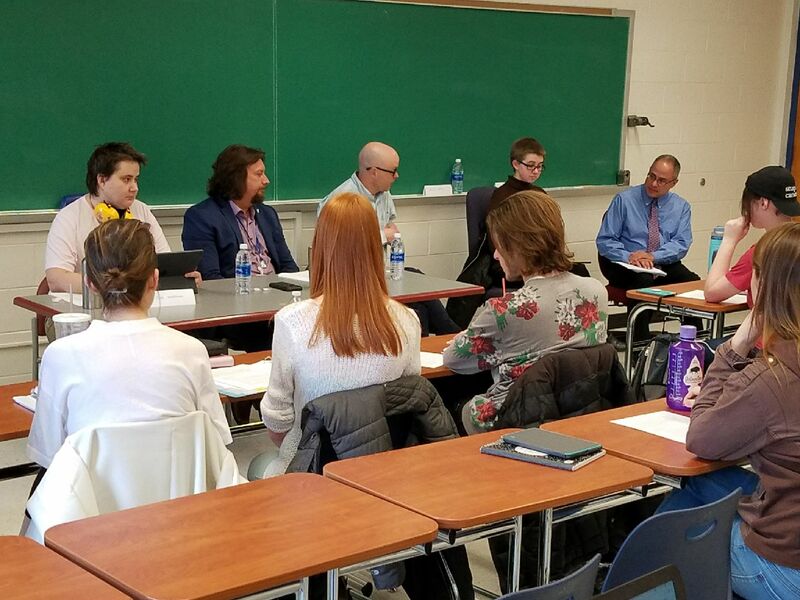 The panel photographs in this post were taken by autism author, trainer, and advocate Catherine Faherty. Thank you for visiting this blog. If you’d like to read more, please see this list of some my most popular pieces on autism and disability or visit the homepage. Your comments and reflections are very welcome below.